My father gave me the gift of financial literacy and it was one of the greatest gifts he gave me. Everyone handles money and makes decisions every day on how to use their money. Too often kids leave home without even a basic understanding of how money works. This doesn’t happen because they have bad parents, but is the result of many pervading myths, including the belief that money isn’t discussed within the home. If you’re like me, you want to give your kids the tools to succeed in life and that includes financial literacy. This knowledge isn’t always meet with much enthusiasm as some parents don’t feel prepared to be the teacher. I understand but you are more qualified than you may realize. The majority of what you need to teach your kids are the things that you are (hopefully) doing today. The best thing parents can do is openly talk to their kids about money. Don’t let money remain a taboo topic in your home. Here are a few easy ways to start the conversations. Teach them money has a purpose. Without one, it’s too easy to spend mindlessly, so in order to become conscious spenders who use their money on what matters most, my girls set annual save, spend and share goals. Every time they earn or receive money they allocate a portion of the money to their goals. Explain “want” versus “need”. This is such a critical lesson. Initially everything may be a “need” to them, but help them see the difference by demonstrating it to them. When your kids ask you to buy them something. Don’t say “no” or “we can’t afford it”, but instead remind them your money already has a purpose (your family goal) and give them a an option to buy it themselves. When you go shopping, don’t internalize your decision process. Talk out loud and share with your kids how you decide what to purchase. Explain why you pay a premium for certain items while others items you don’t. Let your kids manage a small budget for their birthday party or back-to-school shopping. It’s a great opportunity for them to see how much things cost, to learn how to make compromises and to comparison shop. This is just a small sampling of some of the ways you can teach your kids about money. You can find more details and additional lessons to teach your children in my downloadable workbooks. If you do these lessons consistently, you can instill good money habits in your kids and help them build a positive relationship with money. 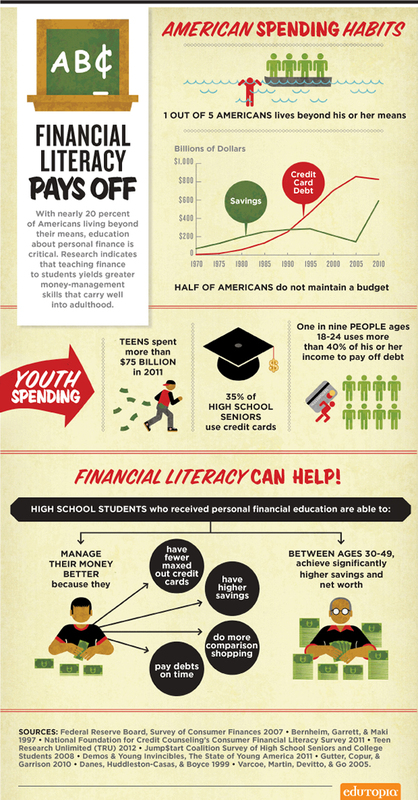 Edutopia put together a great infographic showing the impact financial education has kids. One thing I consistently hear from readers and clients is that they wish their parents had talked to them about money when they were growing up. It’s time to break the silence and start talking to kids about how money works. It does make a difference in their lives. Well, I'm not talking to my kids about money because they aren't born yet! Haha, but I'm starting to think that financial literacy may be the most important thing for them to understand before they leave for college. Last night I was blogging and thinking about how ridiculous it is that there isn't a finance/business class required in high school curriculum. Think of how much material you could cover in a quarter or semester! My mind is racing just thinking about it. LOL! It is hard to talk to kids about money who aren't born yet. :) I agree, DC. Financial literacy is so important to kids financial well-being as adults and it's something that few parents realize. It is really unfortunate that so few schools have embraced financial literacy and it's a topic that can be weaved into so many classes too. 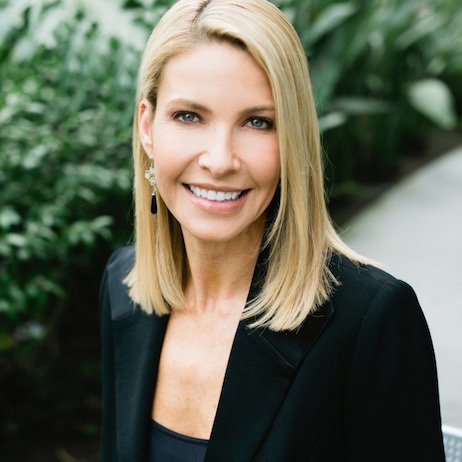 Shannon, I am amazed at how the above tips have groomed our kids with serious financial wisdom. They've become very responsible kids now, as they understand about deciding what purpose they want money for, how to earn it, and how to manage it. We are SO thankful they have the tools to NOT follow our path into massive debt. I love it, Laurie! It just makes me so happy to hear how you and Rick are teaching your kids to be Money Smart. I can see the difference my money lessons have had on my own girls and I am so proud of how thoughtful they have become with money. They appreciate and respect it. They think before they buy something and don't feel deprived when they decide against buying something because they know they're saving for something they want more. Uh-oh! You're daughter is catching on fast! :) She wants to be paid well for her hard work. Smart girl! Thanks, John! Sharing your decision-making process is so beneficial. Otherwise I imagine from a child's perspective the things we buy look very random and that we buy whatever we want. I know having these talks with my girls have really helped too and as you said - create that foundation they can build upon as they get older. I think you're spot on that the first step is simply talking about money. They need to know that it's okay to talk about and feel comfortable doing so. When they get old enough I think there's no substitute for experience. Give them the opportunity to make their own decisions (with some guidance) and let them learn from the consequences. There is no one-time solution. It's an ongoing process. Money is definitely something families need to talk about. There is nothing "bad" about money and it shouldn't be a taboo topic. I want my girls to feel comfortable talking to me about so money so when they face a tough money decision when they get older, I'm their first phone call! :) Nothing beats hands-on experience and being able to guide them through it when they are young, helps them make better choices as they grow older too. And you're absolutely right - this is an ongoing process which I don't think we emphasize enough. It's not one and done. I'm such a fan of the save, spend, share system you recommend for kids. Asset allocation is the key to my making my budget and my lifestyle possible. Thanks, Stefanie! I appreciate your kind words. It's great that you're using asset allocation to create the life you want. Great stuff Shannon! What an awesome tip to let your children manage a small budget for a party or activity. As the info graph states, half of Americans don't even do a budget. Better to get this training now under our watchful eye. And while it's important to talk with our kids about money, it's just as important to model what we teach. They will reject the message if they don't see us living it. Agreed! You definitely have walk the walk, otherwise it won't mean much to them. They do watch to make sure our words and actions match. Lauren did a great job with birthday party budget last year. She thought she had a huge windfall until she started pricing out all the things she wanted. The best part was she learned that she could have a fantastic birthday party on a budget. So many people don't follow budgets because they think they are too restrictive so I definitely want the girls to learn to embrace them. Honestly, I want the girls to have a credit card in high school because I want them to learn how to use them properly while they still live at home. However, I suspect the majority of high schoolers who have credit cards today didn't receive them as a way to learn how to use them before they left home unfortunately. Like Mackenzie, I'm surprised that the rate for high school seniors with credit cards is that high! I know that the companies used to go to campuses (though not sure it's allowed anymore? ), but how do high school seniors get access, I wonder. Interesting stuff, Shannon, and great tips as always! Thanks, Anna! I imagine their parents co-signed for them and hopefully set a low limit and are teaching their kids how to use them properly. Unfortunately, I'm not 100% confident the latter part is happening. As you know, my father also gave me the gift of financial literacy. I love how strongly you advocate for parents to do the same. Hopefully the next generation won't be saddled with the same lack of financial knowledge! At least your girls won't be. You are definitely proof that financial literacy pays off, Erin! Your parents should be very proud. :) Financial literacy is my passion and I very much believe that it makes a huge difference in kids lives. We do so much to try and give our kids the best life possible but we don't talk to them about how to handle money, which is one of the most important things we can do. Financial illiteracy is reversible but only if we start talking to our kids. I tell you, the advice you give is right on. I've seen my two younger teens really change their mindset about money. Marisa wanted to buy a bag today and I was reluctant but she had a $10 off coupon and 20% off that she used and she saved more than half of the item. It was a bag for school so that was a great purchase. Now they're focused on saving for college and looking at sites for buying used books and stuff like that, so thanks for all your advice! I'm starting to like my teens ;).... lol. That is fantastic that your kids are really getting the hang of making thoughtful money decisions. They are developing a great money mindset and you should be proud of them! You have a great week too! Kids do think that everything is a "need." I like the idea of giving them a budget and letting then decide what to buy. I've done this with buying birthday or Christmas gifts for relatives. She can pick whatever gift she wants as long as it costs less than our pre-determined amount. I did have to step in when she wanted to buy Disney Princess Candyland for her dad, but other than that, it worked pretty well. They do, although in fairness I probably did too when I was their age. :) I am really impressed with how the girls are handling budgets and seem to enjoy working with them, which makes this Mom pretty happy! I love that your daughter wanted to her Dad Disney Princess Candyland. Too precious! Next week I'm planning to open my daughter's bank account because every penny she has she immediately put it in her piggy bank. I'm lucky with my daughter she understands the value of money, if she wants me to buy something she asked me first and didn't insist to buy if I refused her in a good way. That's great, Clarrise! It sounds like your daughter is going to be a money pro by the time she's an adults, which is a great place to be! When you're young, you don't realize the consequences later on that bad money habits can stir. But the earlier we can begin to educate and form good money habits in our children, the better. Great tips Shannon! You really don't Anthony. I think many parents think "I'll talk to them when they get older" and they keep delaying the conversation until they are chasing after them as they head off to college. The earlier we can start the conversation - the better. Kids are far more open to having these conversations than we often realize. I think the best way to teach your children to be responsible with money is to show them by example. My friend was saying "no" to purchases that his kids wanted to make saying that they couldn't afford it or that it was not worth it...but then he turns around and spends money frivolously on himself. That sends a mixed message. Agreed, Andrew! Our words and actions need to match otherwise we are sending mixed messages. It's one of the reasons I dislike "we can't afford it", especially if it's not given without a reason "why". They may believe their parents are lying to them or spend money arbitrarily, neither are lessons we want to teach our kids. I keep finding myself talking about your blog to people I see everyday, especially those with kids. What you're doing is so important, and I think all kids should be raised to be financially aware and responsible! Thanks, Vanessa! I appreciate your kind words and support!! I agree that kids need to be financially aware and responsible and it's something that isn't on most parents' radar unfortunately. I'm glad you're helping spread the message! Sounds like you had a wonderful mother, Simon. Setting a good example is so important. Kids are always observing us and often times the things we do carry more weight than our words. Your Mom was a great role model for you and I'm sure will be the same for your kids. The idea behind financial literacy is nothing less than noble. Many young adults reach college and decide to take out student loans, and it being their first encounter with credit and technical financial matters, they often get the raw end of the deal. If we teach children about such matters from an early age, the impact is much greater than teaching them once they start attending college. Agreed! The earlier we start talking to kids about money - the better. Too many wait until their kids are heading off to college and that is too late in my opinion. If they learn at a young age how to think about money and how to use it in alignment with their values, they can make smart choices with their money.